For Sagar Vatapu, life was always a struggle. The worldly slums that he lived in, wasn't all pro learning however. Sagar graduated in the field of Business & Commerce. Hip-hop was his breakaway to freedom from the savage grips of the Dharavi slum. Beat making became his passion that he nurtured along with disc jockeying. Working as a tour guide in the same company as Akash, he too wanted to create something of his own to benefit his community. Thus, finding the right person with the same desire in his friend Akash, he co started the endeavor of the Dharavi travel and tourism, Slumgods Tours and Travel. Born and raised in the Dharavi, Akash always wanted to do something for the community. Break dancing majorly impacted him. Hence, break dancing became his expression of thought, heart and word! Forming a hip-hop crew in 2009, his main aim was to express himself and his message. The crew, lead by Akash, began teaching break dancing to the slum children in order to brighten their horizons through expression as well. Apart from the arts, he worked as a tour guide for a travel and tourism company for a year. Out of this experience came the idea of SlumGods Tours and Travel. With the objective to help the community in terms of education for the kids and employment for the Dharavi slum dwellers, he set up the firm. Better healthy than wealthy is this man's motto. 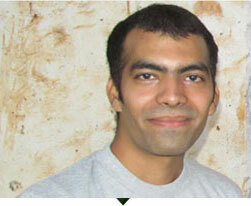 Mr. Rayana is a dynamic personality with a zeal to achieve excellence. He has an experience of five years in the field of sales and customer relationship, with exceptional skills in marketing, communication and networking. Sunil is great at pencil sketches as well, and can while away time in front of a canvas. He became the business partner with Sagar and Akash because he wanted to help the Slum community in removing the negativity that engulfed the slums. Hence evolved SlumGods: an interactive action packed experience for everyone willing to join the ride.